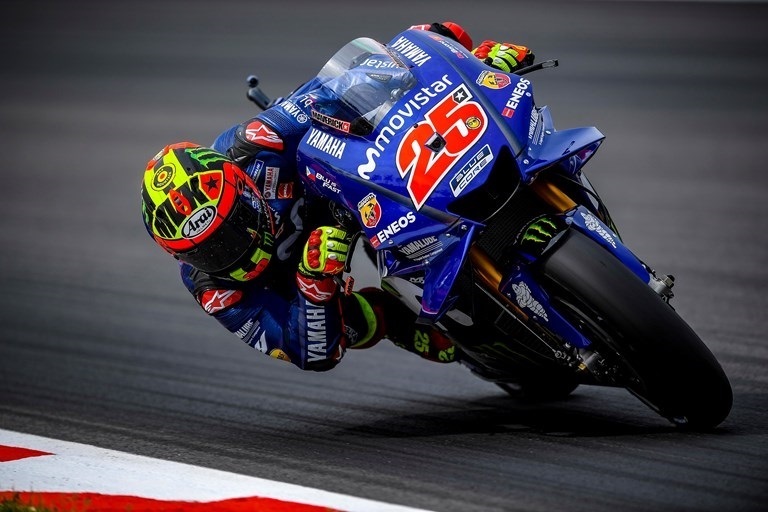 Movistar Yamaha MotoGP’s Maverick Viñales and Valentino Rossi showed speed at the start of the Gran Premi Monster Energy de Catalunya weekend. The teammates used every minute of the two free practice sessions to improve their bikes’ base settings and took third and fifth place respectively in the combined standings. The Catalan GP is a special event for Viñales, who is excited to be riding in front of his home fans this weekend. Debuting a special helmet to commemorate his close friend Luis Salom, the youngster was quick to try his race pace with the base set-up they established at the Catalunya test three weeks ago. The work paid off, as he improved his lap time on every run and ultimately secured sixth place with a best lap of 1’40.114s, 0.658s behind his teammate in first place. The afternoon practice saw the temperatures go up to 28°C, changing the track conditions, but Viñales’ determination and work ethic were unaffected. The local hero was quick to respond when the pace of the rider field increased at the end of the session, and he set a 1’39.422s to briefly hold first place. He ended the day in third position in both the FP2 and the combined free practice results, 0.492s from first. Rossi’s love for the Circuit de Barcelona-Catalunya was clear to see as the Grand Prix weekend kicked off. He had decided on setting a fast lap in the cooler morning session, before getting stuck in to working on the balance of the bike and tyre-life in FP2, and he carried out the plan perfectly. After getting a feel for the track in his first two runs, he put in a soft-soft tyre combination and finished FP1 in first place with a 1’39.456s, 0.347s in front of his closest rival. In the afternoon the Doctor completed part two of the plan. He carried on where he left off, starting proceedings with the exact same tyres, and focused on comparing various tyre spec and setting combinations for the entire duration of FP2. His fastest lap of the session, a 1’39.989s put him in eleventh place in the rankings, 1.059s from the front. However, his fastest FP1 lap still earned him fifth place in the combined timings, 0.526s from the top. With a great team effort, Johann Zarco and Hafizh Syahrin showed an impressive performance today at the Circuit de Barcelona-Catalunya. While Zarco powered to eighth position in the combined standings, he improved his lap time from this mornings’ FP1 to the afternoon session by 0.3 seconds. In the meantime, MotoGP rookie Syahrin did fantastic to reach the top 10 for the first time on Friday, snatching a provisional Q2 entry. The crucial third Free Practice is set to commence at 9.55 local time tomorrow, before both Monster Yamaha Tech3 riders fight for the best grid position ahead of the seventh round of the 2018 season.